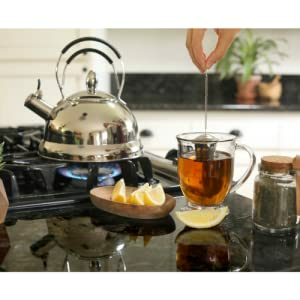 DON’T PUT TOXIC CHEMICALS IN YOUR BODY: The Willow & Everett stove top kettle is 100% teflon-free and BPA-free and is made strictly of high quality stainless steel, iron and aluminum. Don’t take the health risk of buying something you use so frequently that is tainted with hidden chemicals and questionable materials. We offer a 90 day money-back guarantee. If you’re not completely satisfied with your purchase contact us and we’ll make it right. Premium Tea Infuser for Loose Leaf Tea (or Coffee!) Included! 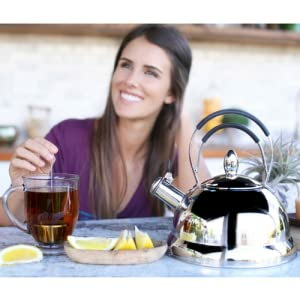 If you’re a tea or coffee lover, you’ll be thrilled to know that this whistling tea kettle comes with a tea infuser ball made out of high-quality stainless steel. 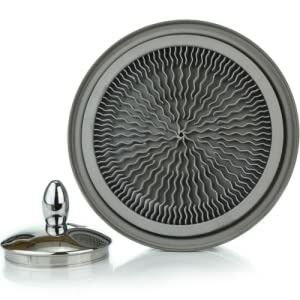 This coffee and tea infuser is perfect for most loose leaf teas including green tea and herbal teas. The tea infuser will reduce debris and unwanted leaves floating in your cup. It even works for coarsely ground coffee! It’s the perfect addition to your tea kettle - especially if you’re giving it as a gift! The large tea infuser is ideal for a large single mug serving. Just fill the tea infuser ⅓ or ½ way with loose leaf tea (or coffee) and let it seep in a mug of hot water. Or you can even use the tea infuser in a tea kettle or teapot if you’d like to make more than one cup! Made with superior craftsmanship Willow & Everett's stainless steel surgical stove top kettle features 18/8 food-grade stainless steel and an ergonomically designed double handled non-slip grip silicone handle. 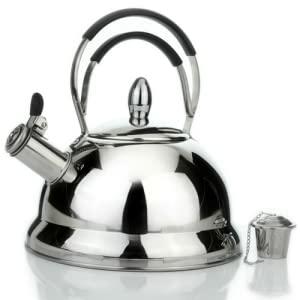 The shiny mirror finish makes this a stand out piece in ANY kitchen and is pretty enough to leave out on your stove! This new advanced design heats up faster than other whistling kettles. Unlike other cheaper, older tea kettles that take a long time to boil, this 1.8 liter tea kettle uses a patented energy saving wavy bottom design that heats your water 40% faster. That means less waiting and a more efficient tea or coffee brewing experience for you! High-end kitchen products that don't break the bank. Subscribe for Discounts, Product Launches, How-To's and More!